Mercedes O'Brien — Chef Kevin Gillespie's restaurant, Gunshow, offers a bold new take on the traditional dining experience. 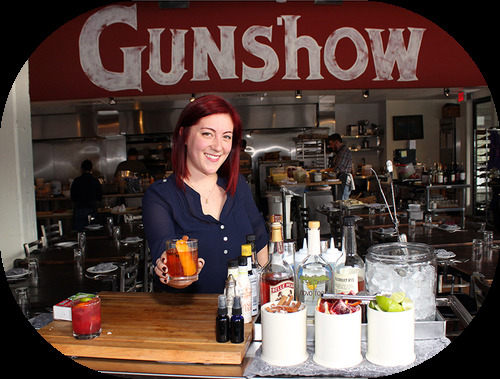 Mercedes O’Brien is the curator of all things cocktail at Kevin Gillespie’s Gunshow. From recipe development to costing, O’Brien cultivates cocktails to complement the ever-changing menu at Gunshow. “For the cocktail development at Gunshow, I draw daily inspiration from the chefs and the team’s personal lives,” says O’Brien. O’Brien’s earliest interactions with Gillespie led her to create her first, and the most popular, cocktail for the restaurant: the Toasted Old Fashioned (made with bourbon, bitters, burnt sugar syrup, brûléed cinnamon sticks and flamed orange peel). O’Brien lives in the Edgewood/Candler Park area of Atlanta and enjoys thrifting and perusing bookstore shelves when she’s not crafting cocktails. Her guilty pleasure is enjoying a dirty gin martini every Monday.